Picturing Disney: Are You Ready For Playtime With Puppy Dog Pals? Disney Junior is bringing a new collection of Puppy Dog Pals episodes to DVD. The new DVD is available now and includes bonus episodes and 8 shorts! Join adorable Bingo and Rolly on amazing missions: deep-sea diving in the Great Barrier Reef, fetching a four-leaf clover in Ireland, running all over Down Under, and much more! Then, meet their brand-new puppy pal Keia in two exciting bonus episodes! Packed with action, music and a ton of silly fun, these playtime adventures will leave you howling with laughter! We love how each episode introduces new topics to kids in a fun way. Traveling around the world is just one of the unique elements of this adorable series. Each story revolves around friendship, problem-solving and adventure. It's fun to see how when Bob's away just how much the pups will play! Isaac Ryan Brown (Bingo), Sam Lavagnino (Rolly) ,Harland Williams (Bob), Jessica DiCicco (Hissy) and Tom Kenny as A.R.F. 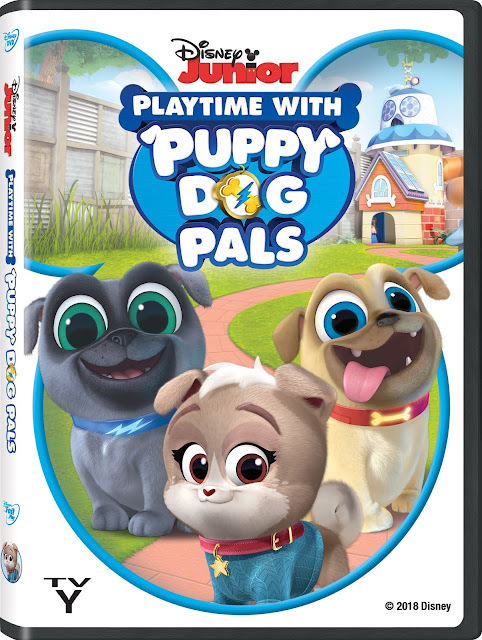 We give Playtime With Puppy Dog Pals 4 paws up and recommend it for the entire family.